You can see all of the details for Turn 2b here. Turn 2b saw a total of 39 games played. All Firestorm troops survived the encounters. The pictures in this blog are some of the fantastic pictures that have been shared through facebook, twitter, blogs, and in emails to me. Sorry if I missed some! 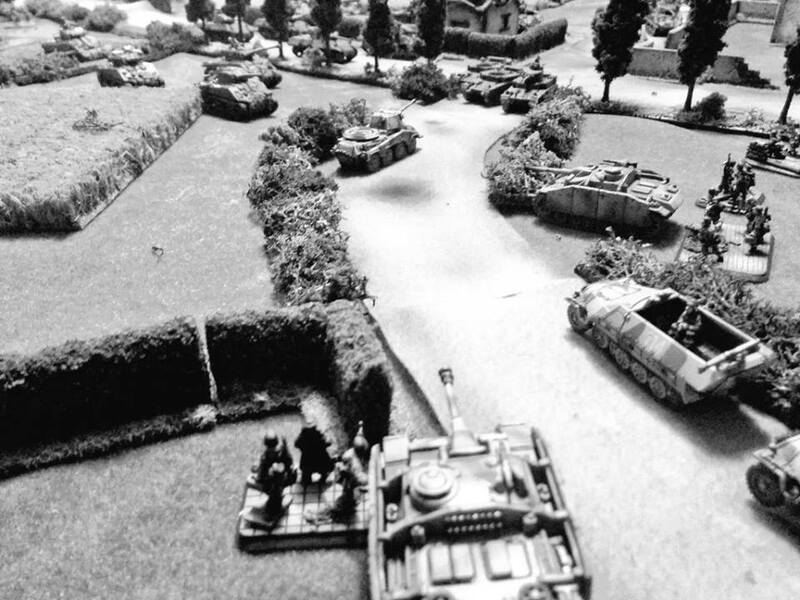 Tank Ace Michael Wittman was deployed to the bocage country around Villers Bocage to stem the rapid advance of the 7th Armoured Division. Through 20 games, the Allies pulled out a 74 to 66 lead in victory points, leading to a 4-3 victory. The top Allied General was Benny C, who managed to achieve a 7-0 victory. The top Axis General was Luke P.
Wittman on the Prowl by Rob T.
Scott burns his son's poor Shermans. With the Mulberry Harbours operating at full capacity, Allied troops needed space to expand the beachead to accomodate the growing number of troops on mainland Europe and to protect supply areas from German artillery. The Canadian troops at Juno Beach launched an offensive to capture Bretteville L'Orgueilleuse. The 12th SS troops in the area had other ideas. Lead by the efforts of Axis Generals Tim and Rich D, the SS panzers halted the Allied advance by a narrow 46-40 victory point margin. Allied Generals Rich B and Jim N showed that there is still lots of fight left in the Canadian troops. TCOW from Mike H of Behind Enemy Lines and the credits of many books on your shelf. After fighting for several weeks without relief or resupply, the 6th Airborne Division finally retreated to the relative safety of Sword Beach after facing an assault from the veteran 2nd Panzer Division. Axis Generals Scott from Vancouver, Vladmir, and Ben E. lead the Axis forces triumphantly back into the devastated town. Allied general Rich B (again!) had a strong showing in defence of the drop zone. The final victory points saw the Axis control Breville with a 30-19 edge in victory points. The 6th Airborne Division retreated back to Sword Beach to rest and refit. Phil had some extra half tracks standing by. In total, the Allies managed to capture Villers Bocage and continue their momentum on the Southern edge of the British area. The Allied attack from Juno Beach has stalled while the Allies have also lost the valuable cross roads at Breville. The Allies were able to land a few reserves at the beachheads, but the loss of Breville meant that many Allied troops were sent back to Britain with not enough space and supplies available on the beachhead. There are lots of fantastic After Action Reports popping up in different formats around the web. Here are a few of them. If you have an AAR I've missed, please post a link in the comments! 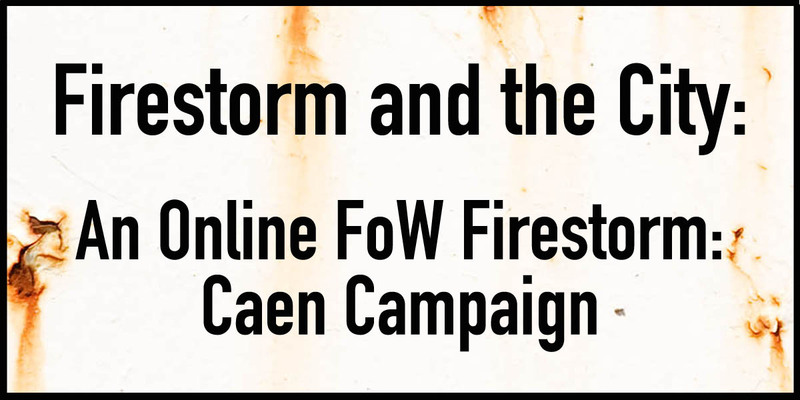 There are lots of great pictures going up in the Firestorm Caen Facebook group (super secret, I'll include the link in the Turn 3 email). 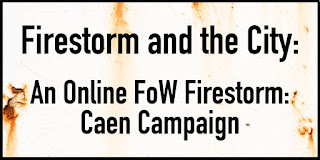 You can also see lots of pictures and posts under the hashtag #firestormcaen or by following @RustandtheCity on Twitter. Sean's Chain of Command in 15mm game. TCOW shoots up a poor cow. Full details for the six (SIX!) battles for turn 3 will be posted on this blog on Wednesday evening. Thanks for submitting results and for your patience while I prepare turn 3! My lack of bocage made taking pictures of my game a no-go. Shame the Canadians couldn't get their sh1t done - I finally win a game convincingly and we still lose overall! Looking forward to the next turn! Yeah, 1 game can make a big difference a lot of the time though! Allies need a breakthrough in turn 3. Glad you are enjoying the content! I cannot read beyond the preview. I click "Read more>>" and nothing happens. This is the third article I've tried to access. Is this due to my being a guest of your blog (i.e. do I have to subscribe/follow)?